Do you know what the best part of the Bible is? Is it the creation story? The Passion of Christ? The really mushy parts of Song of Solomon? Nope. The best part of the Bible isn’t a story at all. It’s the relationship it has to the Mass. This is one of my favorite things about being Catholic. As a Protestant, I obviously had the Bible. In fact, it was everything. I was taught that the Bible was the only thing I could build my faith on because it is the inspired, inerrant word of God. But all I could do was read it, pray over it, and look cool carrying it around at church. That’s about it. I’m not saying that it wasn’t useful. It’s the word of God, so of course it was useful! I’m just saying that was the extent of its use to me as a Protestant. But as a Catholic there’s a lot more. The Bible is most at home in the Mass. In fact, the whole canon of Scripture was formed so that priests would know what was supposed to be proclaimed in the liturgy. The Church needed to decide which books were inspired so they were worthy of the Eucharistic celebration. Why? Because the words of Scripture are preparation for the sacrament (CCC 1154-1155). Word leads to sacrament in the liturgy. I did a lot of reading and praying over Scripture long before I became Catholic. But that’s as far as it could go. 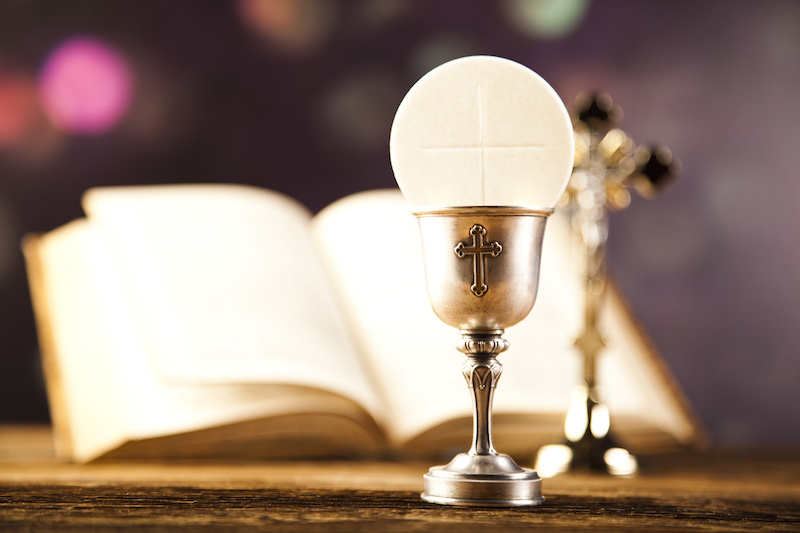 The Catholic faith takes it a lot further because the Bible and prayer come fully together in the Mass and lead us to the Eucharist. They lead us to a real encounter with divinity. It is in the liturgy that God interacts with us most powerfully. All of our reading, all of our prayer finds its end, so to speak, in the liturgy. The “liturgy is the summit toward which the activity of the Church is directed,” says the Catechism (1074). Everything we do in our daily lives should be ordered to the liturgy, ordered to that next real encounter we have with the God of the universe. The liturgy brings us up into the mystery of God. It is where heaven and earth kiss. All the love that our Lord has for us – that love he describes in Scripture – is poured out upon us as he gives himself to us…literally! That’s the best part of the Bible!